Beating the Legend of Zelda requires getting some help. The Old Man in the game giving advice is not the resource he needs to be. And now it’s time for a narrow niche list that nitpicks a video game that’s older than my average reader. 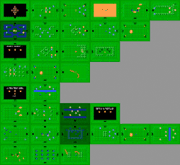 I’m a big fan of the original Legend of Zelda for NES. In fact, just for kicks, I decided to see if I could still beat it from memory recently. I could. And it’s a good thing that all of the tricks, shortcuts and secrets are burned in my brain. Because the hints the game gives you are comically useless. 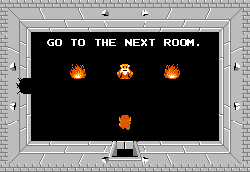 Throughout Zelda you encounter the Old Man (or many identical old men, this is never clear) who gives you hints. But, generally, they’re just meaningless riddles. 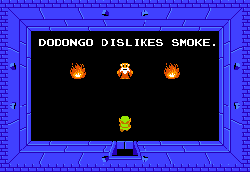 I’ve made fun of his advice a bit before (in 11 Biggest A-Holes In The Legend of Zelda) but, after replaying the game, I felt like that needed to be expanded out to give him his own list. So I picked out his 11 most egregiously bad ones below and ranked them by their uselessness. Take THAT, Nintendo programmers from the early- to mid-’80s! Again, a dynamic combo of mangled subject-verb agreement and so-so advice. He’s saying this because the final dungeon of Zelda is shaped like a skull. And you can find secrets in both of the eyes. Sort of. 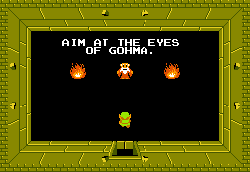 One of the eyes contains Princess Zelda herself and only opens after you defeat the final boss, Ganon… so that’s less of a secret and more of the ultimate endgame. 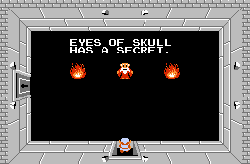 And the other eye contains a compass… which lets you see that you’re in the eye of the dungeon skull. Paradoxically, you probably wouldn’t realize you’re in the eye of a skull until you’re already there retrieving the compass. It’s more useful than a lot of the advice on this list, but, in the grander sense, totally useless. 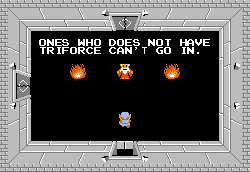 There are a very few things that are true across every video game, across every game console in history. But one of them is: If a bad guy opens and shuts his eyes, the open eye is ALWAYS his weakness. So the Old Man isn’t exactly bringing the groundbreaking news here. And, as you may notice, that does not look like a face. Maybe a cubist piranha? But not a face. 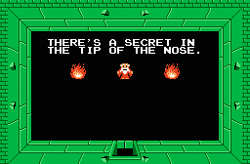 Which, naturally, makes it a fruitless endeavor to try to find the nose. I mean… you DO have to go to the next room. Since there’s clearly nothing advancing the game in this room. Did this old man really need a public service job here? Totally unnecessary. 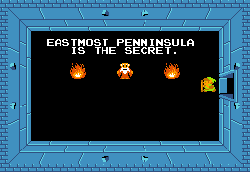 This is seriously Hyrule’s big government run amok. 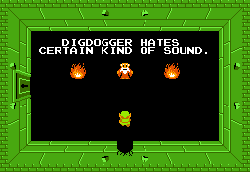 I always hated this advice because it relied on you knowing who the hell Digdogger is. This was fine if you bought the game and read the manual. I did not. I borrowed the game from a friend. Eventually you figure out it means you should play the magic whistle around the orange, sun-shaped enemy… who was arbitrarily named Digdogger. I’m sure that’s translated from a Japanese word that means “whistle-hating happy sun” or something… but still. Don’t make kids read. 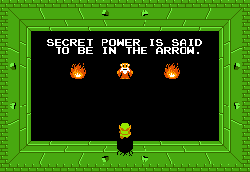 Essentially this means, “Use the arrow.” Which was intuitive when you… got the arrow. This is the Old Man’s most iconic quote because of its sheer abstract zen-ness. Dodongo is the name of the triceratops bad guy (again, you’d have to read the manual to know that). 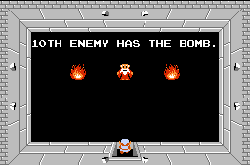 And his beef isn’t so much with smoke, but rather with bombs. The bombs that you get that don’t really produce any smoke. This is horrible advice. 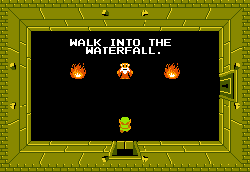 Because it sends you scrambling to the waterfall. And when you walk into it you find… an Old Woman, charging you anywhere from 5 to 20 rubees for MORE abstract and/or intuitive advice. These two old folks are clearly colluding here — a classic carny upsell. I had beef with this during my list of the 11 Worst Japanese-To-English Translations In Nintendo History. The advice combines the worst of all the Old Man’s bad habits: Ambiguous, completely un-useful and a targeted assault on English. This easily takes the top spot because, according to Nintendo lore, it takes the “bad translation” thing to a whole different place. An actual translation of the original Japanese would be “Look For The Lion Key.” The lion key was a skeleton key for the game.